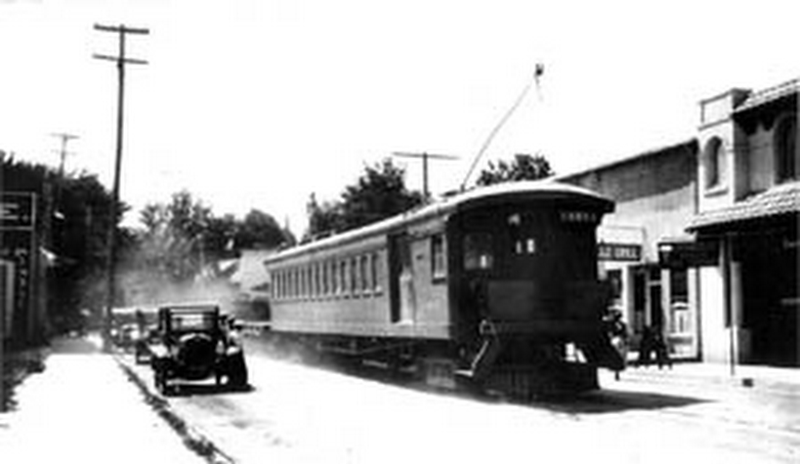 In 1914 the “electric” came to town, linking Alamo and Danville to the outside world in a whole new way. Riders could transfer to Sacramento or Chico or travel through a new tunnel to Oakland’s Key Line, then take the ferry to San Francisco. For a decade the Danville Branch of the Oakland, Antioch and Eastern Railway extended from Saranap (west of today’s Rossmoor), over the hills near today’s Crest Avenue, down Danville Boulevard through Alamo and Danville, turning east over the fields to the new Mount Diablo Park Club. The branch was about 10.15 miles long and carried both passengers and freight. Called the “Toonerville Trolley” after a popular cartoon of the day by Fontaine Fox, the trolley was used by teachers coming to the new Danville high school and by workers during the Great War. While Motor 1051 did not move that fast and its equipment had already experienced a long life, riders were very fond of it. They gave it several colorful nicknames, including the Alligator, the Dinky and the Riveter. Each day at Saranap, Car 1051 was unbuckled from a larger train and sent to the Valley. During the War, Valley commuters used the electric to get to the shipyards at Bay Point (Port Chicago). Paul Ogden said it took him 15 minutes to get from Alamo to Saranap on the “Dinky,” where he boarded the regular train with hundreds of other people going to the shipyard. One conductor, William French, was evidently very superstitious and would not make a trip with 13 people aboard; sometimes he would ring up a 14th or delay the train by matching coins for the extra fare with passengers. Margaret Baldwin and her brother John rode the train to dental appointments in Oakland. Later, when they attended UC Berkeley, they used it to return on weekends, transferring to the Danville Branch at Saranap. Out of the roundhouse at dim break of day. But it’s all the darned railroad the folks there have got. There were large protest meetings when the train’s abandonment was proposed in 1923. The Danville Grange Herald, produced by George Wood, pointed out that Valley residents had subscribed thousands of dollars in stock to support the train and that “the beautiful settlement at Diablo depends upon it.” The paper also linked a campaign to fund the Mt. Diablo State Park with the need to keep the electric train. No more your faults, to all, disclose. At last you’ve earned a long repose. Ira Swett’s Sacramento Northern Through the Sacramento Valley.